The U.S. Geological Survey, in cooperation with the C.P. 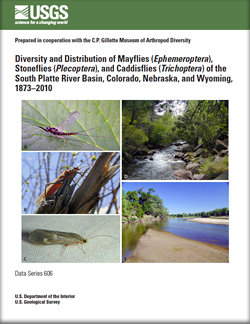 Gillette Museum of Arthropod Diversity (Colorado State University, Fort Collins, Colorado), compiled collection record data to document the historical and present-day occurrence of mayfly, stonefly, and caddisfly species in the South Platte River Basin. Data were compiled from records collected between 1873 and 2010 to identify where regional knowledge about species occurrence in the basin is lacking and to encourage future researchers to locate additional populations of these poorly understood but very important organisms. This report provides a description of how data were compiled, a map of approximate collection locations, a listing of the most recent collection records from unique locations, general remarks for each species, a species list with selected summary information, and distribution maps of species collection records. 1 U.S. Geological Survey, Denver Federal Center, MS 415, Denver, CO 80225. 2 Department of Bioagricultural Sciences and Pest Management, Colorado State University, Fort Collins, CO 82523. 3 6260 South Grant Street, Centennial, CO 80121. This report is presented in Portable Document Format (PDF); the latest version of Adobe Reader or similar software is required to view it. Download the latest version of Adobe Reader, free of charge. Zuellig, R.E., Heinold, B.D., Kondratieff, B.C., and Ruiter, D.E., 2012, Diversity and distribution of mayflies (Ephemeroptera), stoneflies (Plecoptera), and caddisflies (Trichoptera) of the South Platte River Basin, Colorado, Nebraska, and Wyoming, 1873–2010: U.S. Geological Survey Data Series 606, 257 p.